Freedom of Speech is the most important human right. Don’t take it for granted. Freedom of speech. The free expression of thought. The capacity to express a minority opinion that others might deem offensive. It is the most difficult of freedoms that we take as a right. A human right. Guaranteed in the constitutional documents of most democratic countries – and the first thing to be taken away by dictators, be they fascist of communist. Increasingly it is a right under threat right here at home. 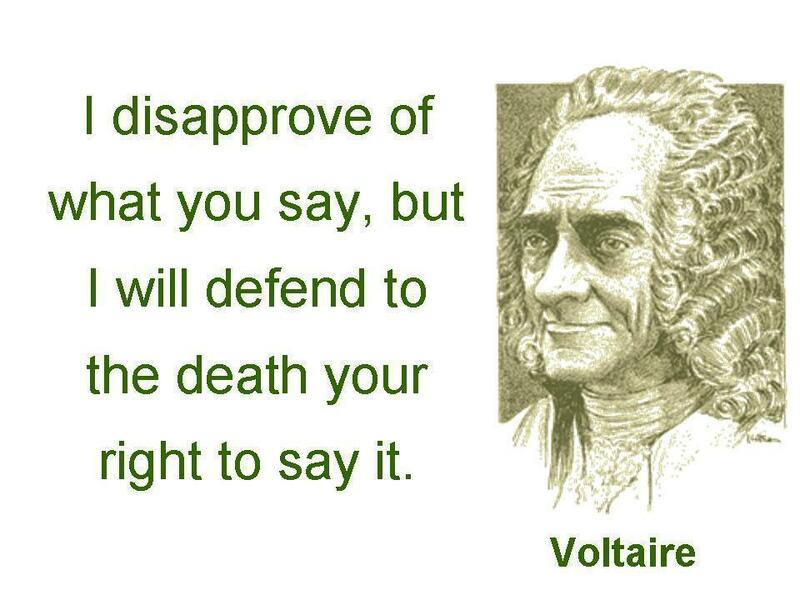 Freedom of speech is, of course, not an absolute right. You do not have the right to yell fire in a crowded theatre (unless, of course, there is actually a fire!). You do not have the right to abuse someone on the basis of their race, religion or sexual preference. But people should not lose their job because of their legal speech, even if that speech offends some people. The ability to speak freely has been boosted around the world by the invention of the World Wide Web by Sir Tim Berners-Lee. Social media has exploded and within seconds I can be reading the words of a Chinese dissident or a North Korean defector or a Ukrainian journalist observing the Russian invasion of her country. Yet that same social media, the speed at which the spoken words of anyone remotely famous are transmitted around the world, is a double edged sword. There exists on social media, especially on Twitter, a feeling of mob rule. It was evident during the Scottish Independence referendum, and has largely continued north of the border ever since – cybernats were blamed for bullying the late Charles Kennedy in his final weeks, for instance, and have been constantly abusive to anyone who doesn’t agree with their own narrow view of the world ever since. Such narrow-mindedness is far too often a feature of mob rule on twitter after all. Another example, much closer to home, are the zealots of feminism – and do not get me wrong, this will only ever be a small subsection of feminists. These people consider every statement by a man through the prism of feminism; but not just feminism, some sort of warped idea that the world would be a better place with no men in it at all. Whatever you say, if you are a man, you are wrong simply because you are a man. This assault on freedom of speech is shown whenever a man makes a statement which can possibly be spun into some sort of anti-woman position. Collectively a number of twitter handles will gather around and publicly discuss how dreadful the man is. I am sure it makes them feel better, but it does their cause no good at all. Take, for example, the case of Sir Tim Hunt. I thought Sir Tim made some extraordinarily poorly chosen remarks in a speech in South Korea, which was widely reported around the world. However for his wife – also a professor at University College London – to be told that he should resign because of them is absolutely disgraceful. If Universities are not to be defenders of the freedom of speech and expression – especially speech and expression that offends people – then what exactly are they for? Science is about pushing forward and challenging the status quo. If scientists are afraid to say what they feel is right then we will not move forward as a society. Now obviously there is a big difference between expressing the ridiculous idea that “women in laboratories cry when they are criticised and distract their male colleagues by falling in love with them” and scientific ideas that might change the world. But if freedom of expression is not defended in the first case, why would it be when it really matters in the second? No doubt they will be ganging up on me shortly – I am, after all, a man daring to suggest that some people who claim to be feminists are actually narrow minded short sighted people who are damaging their cause. I do not believe in equality, I believe in justice. There is a difference. Equality would suggest that men and women have the same chances so they should get to the same position. Justice recognises that the deck is stacked in the favour of men and so proposes that women should be given an advantage so that they can reach the same position. So don’t paint me as some sort of antediluvian misogynist pig. Instead consider how your aggressive shouting down of anyone who dares to make a comment with which you disagree limits freedom of speech – and harms your long term cause. Freedom of speech must be defended at all costs. That doesn’t mean that views that offend cannot be confronted – indeed they must be confronted for that freedom to survive. But that confrontation must be – at all times – polite, courteous and willing to acknowledge that they might not be representing the only point of view. This article was amended at 8.30pm on 20th June to reflect a conversation had on twitter, removing a term I was never particularly happy with in the first place.